It’s amazing how many young writers and readers are on Wattpad these days. Admittedly, I learned about the site very late (I joined in late 2013, so you can say I’m still a n00b), mainly because I haven’t been actively writing fiction since late 2010, and man was I floored upon seeing the writing and reading population in that website. In fact, it had been so popular here in my country that publishing companies have ventured printing popular Wattpad novels, and film and TV producers have been jumping onto the bandwagon as well, producing some of the more famous stories for film and mini-serials. The accessibility of cheaper smartphones and data services has made it easier for the younger generation to access Wattpad. If memory serves me right, there’s a major telecom company offering free access to the site when you avail of a certain data service–that’s how popular it is now to the youth in my country. I personally find this very encouraging for independent and aspiring writers. Back when I started publishing fiction online (this was 2005), I was on Blogspot, and would have no way of knowing if I had any readers until someone actually left a comment on my page. And then forums that encouraged writers to showcase their work (I was on Soomp! and Ficaholics until about 2007-2008) became popular after that, and people somehow became less shy about making their presence known both as writers and readers. Even then, there were those we called lurkers, or readers that merely read fiction and left without a trace. I’ve “met” some of them during these past few years, when they would rediscover my work and find an avenue to contact me, telling me they’ve read so-and-so but never really left comments or made their presence felt at least. It was always nice to hear what they had to say. 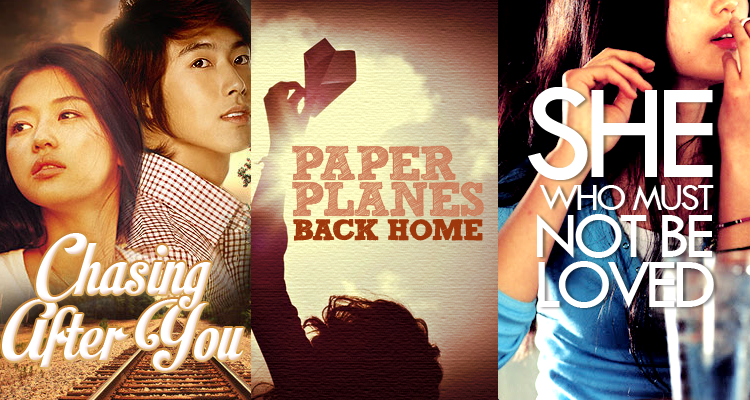 From L-R: My Wattpad covers for Chasing After You (1st ed, 2010), Paper Planes Back Home (1st ed, 2014), and She Who Must Not Be Loved (2nd ed, 2014-2015). Fast track to today with Wattpad, where you can see how many people have seen/read/clicked on your chapters, where readers can leave comments, vote for chapters they liked, and even archive their favorite stories into Libraries or Reading Lists. Writers meanwhile have the option to dedicate chapters to their avid readers, display media (songs, videos, photos) on their chapter pages, and immediately send notifications to their followers if they’re updating a certain story or whatnot. It’s all very interactive, and it opens new avenues for young writers to explore. I find it all very exciting. It’s a really good thing that we’re developing a new breed of writers and readers, but I believe it’s also important to educate them. A piece of fiction published online by an independent writer could be forgiven for mistakes in its structure, grammar, or spelling, but once a publisher is involved, that’s a completely different thing. I mean, if you’re going to ask these kids to buy printed matter, wouldn’t it be a responsible move to at least check that the content is sound? Not all our young readers are well-versed enough in English (or even Filipino, for that matter) to say, “Ah, this is a grammatical mistake” and dismiss it because they know how it is properly done. More often than not, these mistakes will carry over and reflect on the way they communicate with others, written or otherwise. Sure, we have encouraged the youth to read, but we have not prevented them from thinking that a certain word is spelled as such, or that this idiom is actually used in this manner. We have encouraged them to read, but they have not learned properly. And that, I think is a dangerous thing.